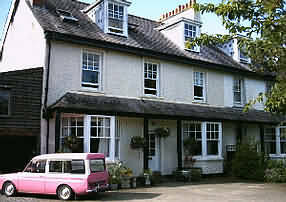 Llanwrtyd Wells accommodation in friendly Llanwrtyd Wells hotels, B&B, Bed and Breakfast, homely Guest Houses, cosy Holiday Cottages, congenial Country Pubs and Inns, luxurious Llanwrtyd Wells Country House Hotels and Caravan and Camping sites. providing quality en-suite accommodation and service. 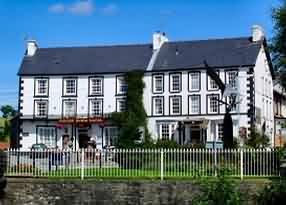 This hotel is situated in the heart of Wales and it is privately run by Roger and Emma Stevens. It is located in a semi rural position in the smallest town of Britain. Their aim is to provide good service and warm hospitality along, with their approach to helping the environment and their extensive use of Organic produce throughout the hotel and restaurant. Assistance, if required, with arranging activities, e.g. fishing, walking, trekking and mountain biking, etc. We do not have bedrooms located on Ground Floor Level. Carlton Riverside has well furnished comfortable bedrooms, all with ensuite bathrooms, TV, DVD/CD players, radio/alarm clocks, tea/coffee etc, plus large towels and good quality complimentary toiletries. We do not, however, provide trouser presses, room service, 'free' sherry, fruit, chocolates etc, sweeping views or extensive grounds - and so you are not asked to pay for them! We DO provide quality, comfort and some of the very best eating you will find anywhere. The Bridge Room looks directly over the river Irfon and the old stone bridge in the town centre, and across the river to the town green. The Oriental Room is a large superior bedroom with a sitting area, but without any view worth talking about! This room is capable of accommodating a child (Z-bed) if required. Carlton House is "Wales Restaurant of the Year"
Carlton Riverside is a Non-smoking establishment. Carlton Riverside Llanwrtyd Wells, Powys. LD5 4RA. The pace of life is easy, and you can choose to either just relax amongst breathtaking scenery and wildlife or enjoy one of the varied activities the area has to offer. 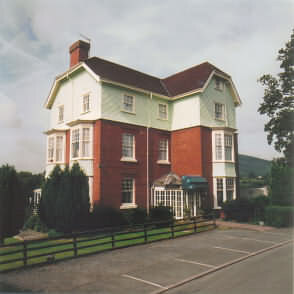 Your accommodation is provided in a family run hotel which has stood in the centre of Llanwrtyd Wells for over 130 years. Its 19th century character, complete with open log fires, has been preserved in the lounge and public bars. Here each night you can meet the townsfolk and listen to the stories from the hills and valleys, some as broad as the fish that get away in the local River Irfon. All of our 21 rooms have en-suite facilities with colour TV and either bath, shower, or both. All rooms have tea and coffee making facilities, shaver point and radio. We are happy to accept well-behaved dogs, but do not allow them in the restaurant. Plasnewydd Bed and Breakfast at Llanwryd Wells is within walking distance of the Heart of Wales Railway Line and provides comfortable holiday accommodation for up to five guests consisting of double, twin and single rooms. Also, ideally suitable for family and small groups. En-suite and private facilities are available. All rooms are comfortably appointed with attention given to detail. Bedrooms are equipped with wash hand basins, beverage trays provided daily with fresh welsh cakes or bara brith, toiletries, bathrobes, tissues, hairdryers, thermostatically controlled radiators and clock radios. Our B&B accommodation at LLanwrtyd Wells offers a blend of traditional Welsh hospitality and scrumptious, extensive, hearty breakfasts with no stinting, food is cooked with pride using the best of locally sourced produce. Copious amounts of coffee are provided. We are happy to cater for guests with vegetarian, gluten free and special diets with prior notice. Sorry, no children under 4 years of age. The idyllic location and breathtaking views, not to mention fascinating history, the warm welcome and the legendary breakfast make Kilsby a very special place and undoubtably one of the finest B&B's in the area. Leave the stresses of everyday life behind. For anyone interested in walking, bird watching, cycling, fishing, horse riding, golf or just relaxing in and enjoying the beautiful countryside then this is paradise. We offer 4star B&B (Welcome Host Gold Award) accommodation from £28.00 per person per night and a luxury 5 star self catering cottage from £300 per week or from £60 per night for a short let. Both the B&B and the Cottage have been awarded the Wales Tourist Board special Walkers Welcome and Cyclists Welcome Award. There is ample, safe, off - road parking and secure, lockable storage for bikes. 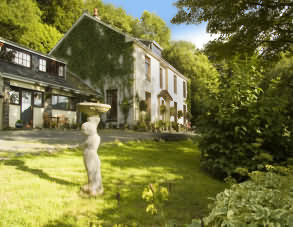 This is a wonderful base from which to explore this little known part of beautiful Mid Wales. See our websites for more information on the accommodation, activities, places to visit and things to do in the area. which is the site of a large, well preserved Iron Age hill fort dated 1 Millennium B.C. Blaen-y-Garn Bed & Breakfast, is located on the A40 between the historic market towns of Llandeilo and Llandovery, close to the Black Mountains and the Brecon Beacons. 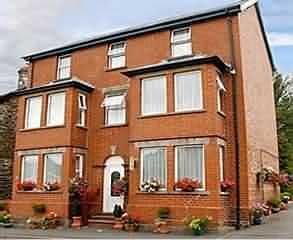 Spacious en-suite room with double bed, sofa bed, colour TV and coffee/tea making facilities. 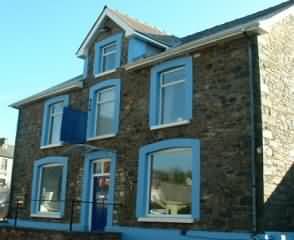 Large family room with double bed, queen size bed, a cot, private bathroom, colour TV and coffee/tea making facilities. Ample private parking space and lock up garage for bikes and bicycles. Evening meals available on request. Spanish and also Italian spoken. 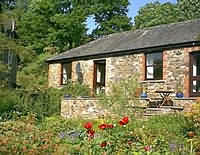 The area offers superb walks locally and good fishing in the Towy river which runs close to the house. Also within a short drive from Blaen-y-Garn B & B are many interesting sites e.g. The National Botanic Garden of Wales, the newly restored historic house and gardens at Aberglasney, Dan-yr-Ogof Showcaves, Talley Abbey and several historic castles. 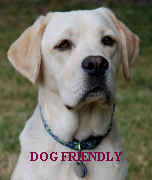 We welcome bikers, hikers, cyclists, walkers and pets. GUIDE PRICE Our B&B rates start at £55 per room per night. Under 10's sharing room £8, under3's are free. We are happy to provide a cot, highchair and even a potty for our teeny guests but would ask you to provide your own cot bedding. we may be the smallest town in great britain but there is plenty to do. Cerdyn Villa offers friendly, relaxing, quality guesthouse accommodation, and with just two guest rooms provides the home from home feel. Guests recive a warm and friendly welcome. comfortable en-suite accommodation and a hearty breakfast from a varied menu which includes a vegetarian option. All our rooms have double beds, TV/DVD players and showers. Rooms offer excellent views of the Ifron Vally. 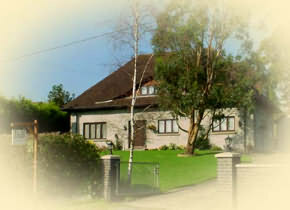 The house has a welcoming garden and a small copse of mature pine trees which guests are free to enjoy. Cerdyn Cottage provides self-catering holiday accommodation for up to five persons, comprising of a double bedroom, a small single bedroom and a double sofa bed in the living room. There is a fully equipped kitchen with cooker, microwave, fridge and washing machine and the cottage has the benefit of gas fired cenrtal heating for those chillier welsh nights. Here, in our four individual cottages in the three acres of gardens and mixed woodlands of a Victorian Hunting Lodge you have the opportunity to immerse yourself in the peace & quiet of undisturbed nature. Our accommodation ranges from a cosy cottage for two to more spacious living for three, four, five or more. Combinations of cottages can be used for families or groups of up to fifteen who wish to spend time together in comfortable surroundings and nevertheless retain a high standard of comfort and privacy. Each of our cottages are light and airy with south facing stone terraces and wondeful views down the Irfon Valley. Here you can sit and watch the Red Kites, Buzzards and Hawks patrolling the skies. The cottages are warm and well equipped and our prices include heating, lighting, bed linen and towels. There is a separate utility and laundry room with a tumble dryer and washing machines. There is also a sauna available to guests on an hourly or sessional basis. 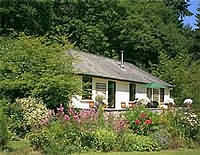 The use of the cottages includes discounted access to fishing in the River Irfon. The River Irfon winds its way down the wooded valley directly below your cottages cutting many large and small pools into the slate rock. One of these, the 'Washpool' is only a few hundred metres away and provides (on warm days!) a natural swimming pool surrounded by mountains and forests. The Trout Inn is a local pub which also offers B&B accommodation in the village of Beulah which is on the A483 between Builth Wells and Llanwrtyd Wells.